A sense of our moral obligation to act responsibly and proactively in the pursuit of sustainability in the coffee supply chain guides and motivates decisions every day at Zest. Values of good ethics, transparency and respect regulate our relationships with all stakeholders in our business and beyond. At Zest we strive to implement and promote ethics and practices that show respect for the environment and community we live and operate in. We respect, educate and uplift people. We reduce waste, re-use, recycle and up-cycle and help our stakeholders to activate similar practices. We use renewable energy sources where possible to minimise emissions and pollution. We support and promote a culture of responsible sustainability at every touch point of our business operations. Lean out from single use cups and consumables. In 2018 we banned the use of single-use cups and plastic consumables such as straws and drink bottle in all Zest facilities as a way to help our team support the responsible culture of change necessary in our industry. We also promote initiatives such as ‘The Last Straw’ with our café partners, to educate and encourage the abolishment of single-use consumables. Zest actively promotes the use of reusable drinkware in a continued push on the ‘War on Waste’. Our branded range of reusable cups offer functional and stylish alternatives for single use cups. We are passionate about promoting and supporting ideas such as mug trees and other innovative ways to encourage our café partners to support the cultural change toward conscious consumption. Our Artisan cup project helped promote the idea that your reusable can be a part of your style story. We had beautifully crafted pottery cups made by a local artist and documented the journey as a way to connect with the maker (another passionate Zest initiative). Zest’s roastery runs on electricity generated by solar power – a decision we made two years ago to make use of a clean, renewable energy resource reducing our carbon footprint. 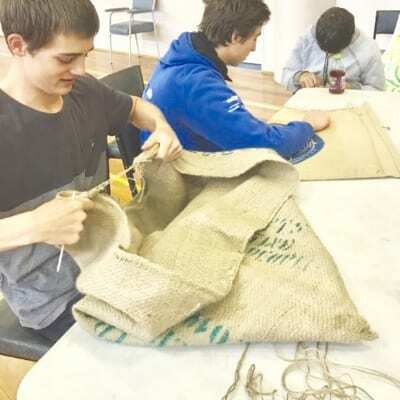 In the quest for the reduction of landfill through re-use, Zest offers the empty hessian coffee sacks free to partners in a variety of industries who up-cycle the could-be waste material. Hopeworks, is one organisation we donate to that assists with education of non-academic students, uses our sacks in a sustainability module where students produce reusable supermarket bags. Wurruk’un is a self-sufficient community in Gippsland seeking to pioneer and demonstrate a ‘simpler way’ of living based on permaculture principles. We donate our hessian sacks, which they use to line their veggie gardens and our coffee husks which they use for the community’s composting toilets. Zest has a continuous program of working with farmers to research, develop, share knowledge and processing techniques that help farming communities increase quality resulting in the opportunity to command higher remuneration for their product. Zest’s Project Raggiana is one example of a successful mission. In 2017 we conducted a pilot, low-oxygen fermentation project on site in PNG resulting in a four point increase in quality score on the micro-lots produced. The cooperative has since run a larger scale trial using our protocol, producing 100 bags of higher-grade coffee, which will sell at a premium price. Zest is registered with the Rainforest Alliance (Registration ID RA37789) and buys RFA beans to support the efforts of this organisation towards environmental, social and economic sustainability. These efforts include significant efforts to curb deforestation, protect wildlife, manage waste and reduce use of agrochemicals on the path to coffee farm certification. Zest pays premium to source coffee from Brazil in paper sacks made from 100% recyclable and renewable material rather than hessian.